Must be over 25 years of age to rent our houses. During the summer season, we only have weekly rentals, Saturday to Saturday. We live nearby and will greet you upon your arrival, so show you around and answer any questions you may have. You will love our house and complex and have your best vacation ever, in an oceanfront complex, and our house is only 75 steps from the beach. This, privately owned home in MYRTLE BEACH, is beautifully decorated in vibrant Caribbean colors. Located in a family-oriented community with 24-hour security and an enforced ten-MPH speed limit. Our house has FREE wireless internet and our complex has a mile-long private beach, w/lifeguards and rental chairs/umbrellas available. The deck has bar height table/chairs, so you have a great ocean view. We have flat TVs in every area, CD player, fully-furnished kitchen, outdoor shower and a wonderful atmosphere for relaxing while enjoying the spectacular view. Our complex has a large recreation center with planned activities, LARGE FREE WATER PARK, two pools (one indoor), playgrounds, ocean-side basketball, volleyball, bocce ball, bean bag, shuffleboard, mini-golf, etc. Also, located on our grounds are snack bars, grocery store, and many other facilities. Amenities: Our house has FREE wireless internet access, air conditioning, extended cable TV in every area. KITCHEN is fully equipped with everything you will need - microwave, dishwasher, crock pot, blender, coffee maker, large granite counter space, , etc. There is a charcoal grill, outside shower, washer/dryer and covered parking for three vehicles. Miniature golf, arcade, snack bars, grocery store, walk-up basketball, volleyball, bocce ball, biking, horseshoe, bean bag, fishing, shelling and many other activities provided in our complex. Nearby are restaurants, live theater, cinemas, museums boating, sailing - just about anything you can want in a beach vacation (no snow skiing). You may bring your own linens or have a linen package provided for $125. This includes sheets for all beds, bath/hand towels, wash cloths, and kitchen towels, no beach towels. Hurricane policy - If there is a mandatory evacuation, refunds will be prorated for days in effect. Lost keys will esult in $75 fee, deducted from deposit. Linen package - $125. for sheets, towels, no beach towels. Or you may furnish your own linens. Golf cart: We have golf carts available for rent with our houses. $500. Refundable Damage Deposit during summer season. You may bring your own linens or have a linen package provided for an additional fee. Parking for three vehicles under the house and complex has overflow parking lot. you may bring your own towels, or have linen service provided for an additional fee. Fully equipped, with crock pot, blender, toaster, coffee pot, etc. Loved the property and owner was awesome and easy to work with and attentive to all our needs. Definitely will stay again! This was a delightful family, we enjoyed meeting them and hope to have them stay with us again. Very relaxing stay. Rooms are painted beachie, love the colors. Owners are wonderful to work with. Thank you Suzanne we had a wonderful time! I miss sitting on the deck overlooking the ocean and having my coffee every mornig . It was our pleasure to have this extended family stay in our beach house. Nothing better than having morning coffee, while watching the waves roll in. The best way to start the day. This was a delightful family and it was our pleasure to host them. 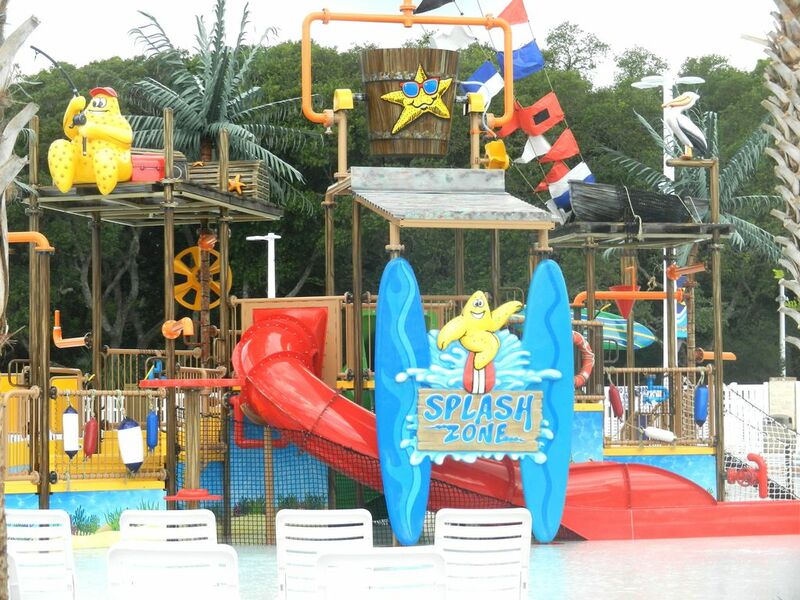 We love our water park, free to all guests, and feel there are many things for all ages. The lazy river is one option, as well as the splash zone. All our grandchildren, nieces and nephews love spending time at the water park, but mostly they just love the beach. Our spring vacation in Just Wonderful was everything we could have wished for. This house is beautiful and actually looks better in person than on the website! We were thrilled when we got there and saw it! It really is amazing and we'll definitely keep "Just Wonderful" in mind on future visits to MB. We loved having such a beautiful, relaxing place for us to vacation. Suzanne really puts so much work and extras into her beach house and it didn't go unnoticed! PS...we enjoyed looking at her paintings as well!! Our best vacation ever! Such a nice house with a "just across the street" walk to the beach. Great house, great kitchen, great decks. We're already planning another visit! Thanks to Wanda and Suzanne for making our vacation such a pleasure! Golf: Golf carts may be rented from owner for use during your stay.